Don't Recall Using Anything Else!! This product was at a great value. it do what it supposed to do. I've used Advantix for many years and will continue to do so. i use it all the time.. Very effective. Easy to apply. Effective. I have never seen a flea or tick on my dogs and where is I live is "tick country"
This product cover most bases of inscent repellent & control. My small dog had a skin reaction. Large dog tolerated it fine . I will need to go back to Advantage. No fleas or ticks with this product. 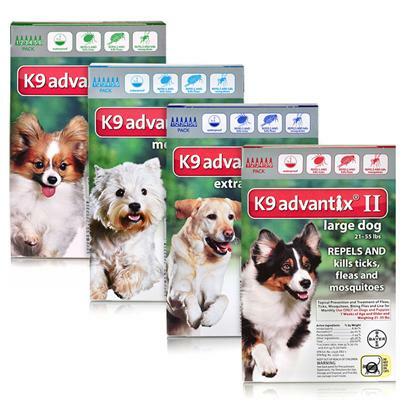 K9 Advantix II for Dogs Really Does the Job! THIS PRODUCT DOES NOT WORK!!! There ain't no Bugs on me!!! This stuff just plain works. It works great on my boys, less scratching than before. Works better than other brands I've tried. . . .
Works well. My Pom is sensitive & this has been the only product that has caused her any discomfort.